Discover how the chemical reactions which produce the extraordinary colours of the Northern Lights have their origins in outer space. 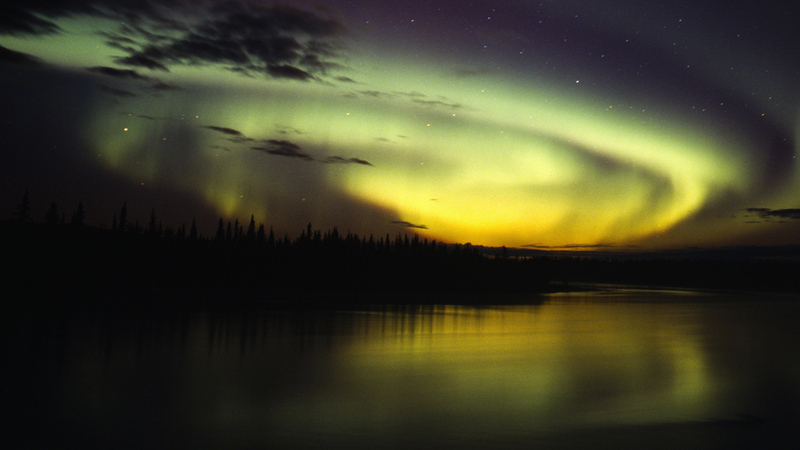 Aurora Borealis, or Northern Lights, is a natural light show that occurs at the poles. Magnetic activity on the Sun's surface propels super-fast charged electrons and ions into space - this is known as solar wind. The solar ions collide with atoms in the Earth's atmosphere and emit photons of light. The colour of the light emitted is dependent the type of atom the ions have collided with - a blue or red glow means that a nitrogen atom has been struck. The Northern Lights – Aurora Borealis – are one of nature's most beautiful phenomena. Visible only at night, and lasting from a few minutes to sometimes hours, this spectacular light show has its origin millions of kilometres away.